Dr. Jenny's cymatic images are truly awe-inspiring, not only for their visual beauty in portraying the inherent responsiveness of matter to sound (vibration) but because they inspire a deep recognition that we, too, are part and parcel of this same complex and intricate vibrational matrix – the music of the spheres! 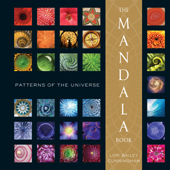 These pages illumine the very principles which inspired the ancient Greek philosophers Heraclitus, Pythagoras and Plato, and cosmologists Giordano Bruno and Johannes Kepler. in the Autumn 2010 issue of The Quester magazine. "Any time Jeff Volk comes to your town, I highly recommend attending his workshop. His presentations on the science of Cymatics will change the way you relate to the sounds and music in your life." There are no upcoming presentations scheduled at present. Experience the art and science of sound with award-winning documentary producer, poet and Cymatics publisher, Jeff Volk, and his special guest from Brittany, storyteller and therapeutic harpist, Esther Mirjam Griffioen. Thursday, September 29, 2016 · 7:00 - 9:30 p.m. The Healing Power of Story, Song and...CYMATICS? Sunday, October 2nd, 2016 · 2:00 - 6:00 p.m.
Thursday, June 9th, 2016 · 7 - 9:30 p.m.
Saturday, June 11 · 10 a.m. to 5 p.m.
with Jeff Volk and Mandara Cromwell. Wednesday, Nov. 11, 2015 · 7 - 9 P.M.
Space is limited. Pre-registration advised! Thursday, Nov. 12, 2015 · 7 - 9 P.M.
Live Webinar with Gabriel Kelemen, Ph.D.
Sunday, Nov. 15, 2015 · 10 A.M. - 5 P.M.
with Jeff Volk and Gabriel Kelemen, Ph.D.
Tuesday, Sept. 29, 7 - 9 p.m. The science of Cymatics vividly demonstrates how inert substances can be "brought to life" when stimulated by audible sound frequencies. Witness powders, pastes and liquids transforming into lifelike, flowing forms- assuming the same complex geometric patterns that appear throughout the natural world, and in the art and architecture of the world's wisdom traditions. View a striking new array of Cymatic imagery from Romanian artist and pioneering researcher, Gabriel Kelemen, Ph.D.
Gain insights into the unseen, yet universal dynamic process that shapes our world, from the microscopic to the macrocosmic. Challenge yourself to consider how these basic universal principles shape your very life! Time for conversation follows the presentation. An assortment of Cymatics books and DVDs will be on hand, as will a copy of Kelemen's brand new book, The Universality of the Vortex-Sphere Archetype! 8 PM - 9:30 PM, EST. Six successive Wednesday evening presentations by leading scholars, researchers and practitioners, surveying the vast and diverse field of sound therapies. On Wednesday, February 11, at 8 PM, Eastern Time, Jeff Volk will join sound researcher and the host of this webinar, Alexandre Tannous, to explain the science of Cymatics. Short video clips of Cymatics experiments will shed light on this arcane branch of physics, highlighting certain esoteric principles of nature that underlie a wide range of sound-based therapeutic approaches. Tuesday, Aug. 26 - 7:00 P.M.
on the East Coast or on the Web. Award-winning producer, Jeff Volk, has gathered these esteemed and experienced colleagues for an informative and inspiring afternoon that is certain to be substantive, dynamic, and deeply engaging. Jeff will open with a brief overview of Cymatics, explaining how this science of vibration and sonic forms laid much of the conceptual groundwork for the development of sound therapies. Click here to view Cymatics video clips. 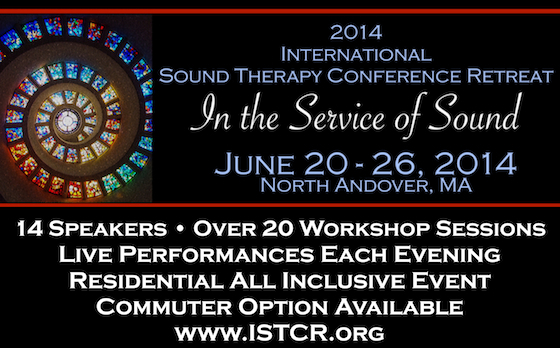 Mandara Cromwell, producer of the annual Cymatics Conference and founder of Cyma Technologies, will offer an in-depth presentation of Cymatherapy, describing the theory and the science behind their precision therapeutic instruments. Wendy Young is the founder and director of the Princeton Sound School, co-director of the Sound and Music Institute, in NYC, and a music teacher at Princeton University. As a Cyma practitioner, her presentation will focus on the clinical aspects of Cymatherapy. Wendy and Mandara will offer attendees an opportunity to experience the two newest Cymatic instruments, the AMI 1000 and the AMI 750.
in the Museum’s Art and Nature Center, in the heart of Salem, MA. Cymatics, the study of wave phenomena and vibration, is a scientific methodology that demonstrates the vibratory nature of matter and the transformational nature of sound. It is sound science, and amazingly cool! HEAR the mellifluous strains of MusiCure,™ music specifically composed and clinically proven in therapeutic environments in Scandinavia, and now available in the US! FEEL REVITALIZED as we bathe in the sonic atmosphere that we'll all compose! UNDERSTAND the power we each have to create, sustain and destroy elements in our personal worlds. IMPLEMENT practical approaches to creating greater harmony in life by becoming more aware of those unconscious vibrations that we constantly enliven throughout our day. Cymatics shows how vibrations interact to create the world we experience 'out there' and it brings to light hidden principles which underlie all natural processes. Understanding these principles can help us to 'cleanse the lens' through which we perceive our world, thereby clarifying our outlook on life. Once you've objectively observed the rhythmic interplay of chaos and re-integration in simple powder, you may view your own tumultuous circumstances a bit more objectively (and with far less apprehension!) 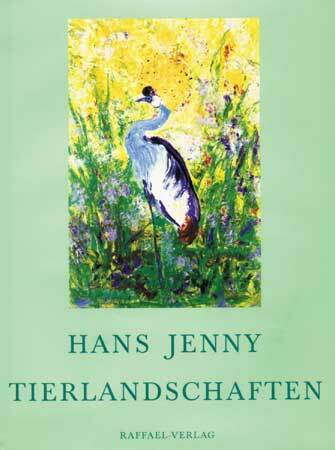 as a purposefully evolving process leading toward greater personal coherency and equanimity. This wide-ranging program weaves startling scientific artistry with poetry and music, to demonstrate pragmatic spiritual principles. It is accessible to anyone with a willingness to entertain the inconceivable: that you can be all you imagine yourself to be, and nothing more! For over 25 years, poet, producer and publisher, Jeff Volk, has popularized the science of Cymatics, producing videos of the pioneering experiments of Swiss scientist Dr. Hans Jenny, and re-publishing Jenny's long out-of-print Cymatics books. His latest publication, Water Sound Images, showcases exciting new research of German photographer, Alexander Lauterwasser. The phenomenal success of his award-winning video, Of Sound Mind and Body: Music and Vibrational Healing, inspired him to produce the premier conference exploring sacred sound and healing music. Jeff artfully distills this wealth of experience into multimedia programs and feature articles, which have been presented and published worldwide. More information may be found throughout this site. Please email jeffvolk@rcn.com to be sure it is still available, as we are now only doing VERY LIMITED retail business! Santa Fe and San Diego. 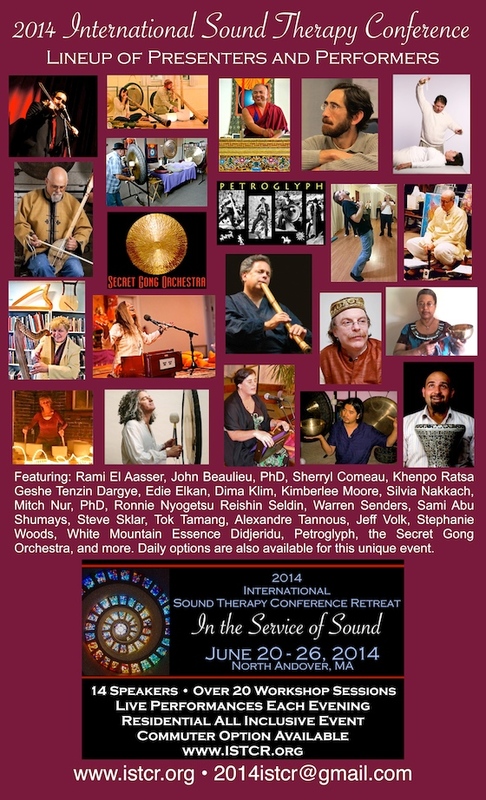 Experience the power of sound, from ancient healing techniques to tomorrow's technology. Hear experts on the cutting-edge of energy medicine present in lay terms the art and science of tomorrow's healthcare. Jeff will be opening the conference on Friday evening and Keynoting on Saturday morning. 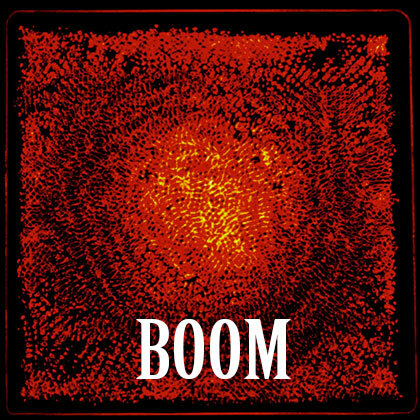 Listen to Jonathan Goldman's interview of Jeff Volk and Mandara Cromwell (recorded September 11, 2013) discussing the upcoming Cymatics Conference!